Doctors Bryan Méndez, Laura Peticolas, Nahide Craig, Janet Luhmann, and Michelle Larson developed and produced these lessons using funding from the Education and Public Outreach program of the NASA STEREO-IMPACT Mission while at the Center for Science Education at the Space Sciences Laboratory (CSE@SSL) at the University of California in Berkeley. Several people at CSE@SSL helped with testing, editing, and producing the lessons and the guide. We thank them heartily: Darlene Park, Igor Ruderman, Karin Hauck, and Todd McGill. The teacher feedback we received regarding these activities was invaluable and we are especially grateful for their comments: Tom Shefler, Libby Dalcamo, Lonny Villalobos, and the many teachers who took part in our workshops at national conferences and CSE@SSL. We also thank Dr. George Craig and the NASA reviewers for giving us their comments on this teacher’s guide. And last, but certainly not least, we would like to thank those involved in creating the Lawrence Hall of Science Great Exploration in Math and Science (GEMS) Teacher’s Guides for Grades 6-8, because this teacher’s guide was inspired by the GEMS guides. In the sessions of this teacher’s magnetism activity guide, “Exploring Magnetism,” your students will act as scientists discovering magnetic fields and electromagnetism through inquiry and measurement. Included at the beginning of each session is a summary of the session, a list of national education standards that the session covers, and a list of materials required for the session. Each session is broken into several activities, with each activity outlined for the teacher. In the Background Material section, you can find science background for the lessons. A glossary can be found after the background section, and at the very end we recommend different resources finding materials to purchase and for learning more about magnetism. 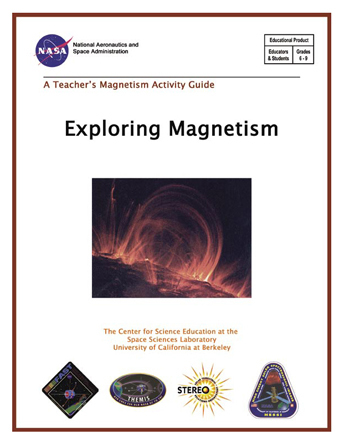 The activities in this guide are meant as primers for supplementary guides that allow students to learn about the importance of magnetic fields in space science, which are studied by NASA scientists. For example, in Exploring Magnetism in the Solar Wind, students learn about the stream of charged particles emanating from the Sun—called the Solar Wind— and how NASA scientists are designing a mission called STEREO to study it and its magnetic field. The other guides, Exploring Magnetism in Solar Flares and Exploring Magnetism in the Aurorae, allow students to learn about magnetism in the Sun-Earth System with more hands-on lessons. Around 1000 A.D., the magnetic compass was discovered in China. But not until 1600 A.D. did William Gilbert publish “De Magnete,” declaring that Earth is a giant magnet. More recently, scientists have found magnetic fields associated with planets and the Sun. It is now well known that the Sun’s magnetic field reaches out past the planets. Charged particles spiral around this magnetic field as they move out past the planets with the magnetic field. The charged particles make up the solar wind. This wind, together with the Sun’s magnetic field, interacts with Earth’s magnetic field. This complex interaction causes electric currents to flow through Earth’s upper atmosphere/ionosphere, causing the Northern and Southern Lights (aurorae) to glow green and red. These currents can induce strong currents in power grids, occasionally blowing fuses and shutting down large sections of cities at high latitudes. The Sun sometimes stores so much energy in its magnetic field that when localized parts of the field rapidly change their shape, enormous amounts of energy are released. These rapid changes in the solar magnetic field cause Solar Flares and can also accelerate solar wind particles to nearly the speed of light. This tremendous release of energy is sometimes associated with large pressure pulses of solar wind that interact with Earth’s magnetic field, accelerating particles to extremely high energies in the radiation belts, i.e. Van Allen Belts, in Earth’s magnetic field. The solar wind particles moving at near the speed of light can harm astronauts not protected by their spacecraft. The energetic particles in the Van Allen Belts can damage or destroy human-made satellites. In order to understand and predict these phenomena, we need to understand what magnetic fields are. The education programs of NASA’s STEREO-IMPACT, RHESSI, THEMIS, and FAST missions provide these sessions and activities on magnetism to inspire your students to learn how electricity and magnetism are connected, and how to apply this knowledge. The goal is for your students to develop a deeper understanding of electromagnetism. The first session in the guide is designed to teach students that magnets have an invisible force field known as the magnetic field, and that this field has an effect that can be measured around the magnet using a compass. There are two activities in this section. Activity 1 explores magnetism and uses compasses to map magnetic field lines and their directions. Activity 2 uses iron filings to visualize the magnetic field lines in two and three dimensions. The second session is designed to teach students that electricity flowing in wires creates an invisible magnetic field that can also be measured using a compass, that the larger the current the stronger the magnetic field, and that moving magnets across wires creates an electric current. This session has five activities. Activity 1 is a free exploration activity looking for magnetic fields around a room with compasses. Activity 2 is an activity to discover that electric currents can be the cause of the magnetic fields seen around electronic devices. In Activity 3 students use compasses to trace out the magnetic field surrounding a coil, in the same way as around a bar magnet in Session 1, Activity 1. In Activity 4 students investigate the strength of the magnetic field produced by coils of wire with current traveling through the wire. And Activity 5 demonstrates that moving magnets across a closed wire loop will generate current as measured by a galvanometer. All of the activities are inquiry-based. One benefit of such inquiry learning is to teach the students how a scientist performs research by asking questions, testing their ideas, and collaborating with others. Another benefit of inquiry-based activities is to engage the students in the process of learning science. These sessions can be used as a unit on magnetism in an Earth or Space Science course, a Physical Science course, or as a supplement to existing science curriculum. The activities can be used together or separately, depending on the time available to the teacher. We estimate that teaching all of the activities in each session in the guide would take two weeks (ten days) in an 8th grade classroom with 50-minute class periods, i.e. a total of 8.3 hours. The entire guide could be done in five days with 50 minute class periods, if some activities were cut or demonstrated. These activities may also be used in science museum center offerings and in teacher professional development short courses.